Lately, I have been feeling stuck. The medical journey is incredibly long, and sometimes it feels like there is no end in sight. I am constantly counting down to a milestone: Match Day, the end of medical school, moving to Chicago, the end of intern year, and eventually, the end of residency and fellowship. There are days when I wish we were closer to the light at the end of the tunnel. It would be nice to know where we are living for longer than a few years and to have a little financial stability. Looking ahead gives me hope that never seeing my husband now will be worth it in the future. That said, I don’t want life to start when we are 32. Intern year has been the hardest year of my life, but I will always treasure the memories of the adventures we had in Chicago on Christopher’s days off. Do I wish he was around to explore with me every weekend? Of course. Still, we try to make the most of our time together every chance we get. Honestly, we should be spending as little money as possible this year, but I know I will regret it if we don’t see as much of the city as we can. We will be 32 in the blink of an eye, and our time in Chicago will be a distant memory. I remember thinking medical school would take forever, and here we are, already discussing plans for moving back to Texas. 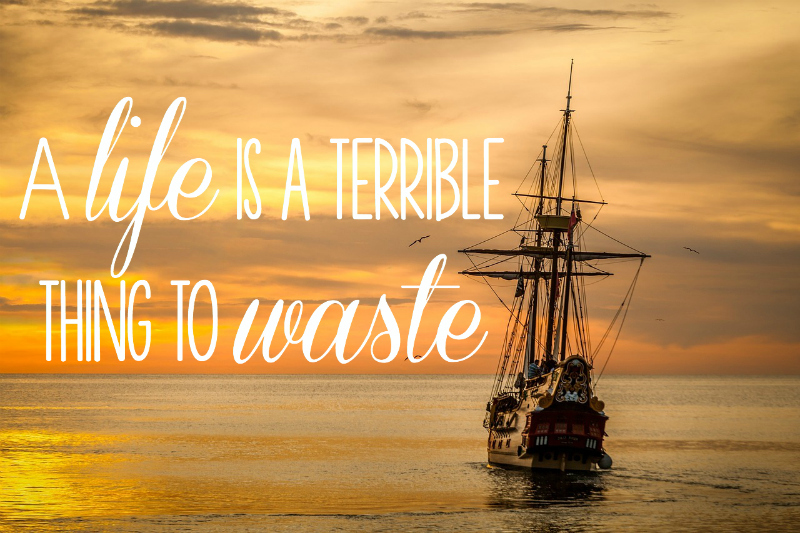 When we finally reach our destination, I want to look back on our medical journey and feel like we actually lived it…because a life is a terrible thing to waste. Have you ever felt stuck in your life? LOVE LOVE LOVE. This is something I am constantly struggling with. I would hate to get to the end of the journey and realize I spent ten years just waiting. Well said, friend! I've definitely been there before and it's so tough. It sounds like you have the right attitude though and as long as you can continue to look on the brighter side of things, that's the best you can do! Life goes so fast. Thinking of you guys! I've definitely been there! I think we all have! It's so important to not just wait and it's such an easy trap to fall into! With my husband being gone so much, we always try to make the most of the time we do have together. I agree-I think it's something everyone feels! I am glad you are also trying to make the most of limited time with your husband! I hate that you feel stuck in this, but I'm glad you're making the most of it! Definitely get out and enjoy where you are now, because you're right...you don't want to feel like all of this time was wasted! I know you're not always sharing the hard parts of this journey with us, but the good parts you do share seem like a lot of fun. I can't imagine dealing with all of the unknowns with medical school, but it seems like y'all are really enjoying your journey so far! I've loved getting to see all of the fun things that y'all have been able to do in Chicago, and it's crazy to think that your year is almost over! I hate the stuck feeling. I sort of feel like that right now but I'm trying to make changes so that I no longer feel stuck. You have the right attitude and I know everything will work out in the end. That can be really hard. My husband doens't work on the weekends but he works long hours during the workweek and sometimes I feel a little sad myself. I'm like- why can't you come meet me for dinner at this new spot I found?!?! Esp. when you are removed from your social circle in a new place. I will say though (and not in any way diminishing your feelings now) that I bet you will look back at this time when you had less money than you will in the future and think of it so fondly. You are young, exploring a new city, cultivating new experiences and have enough money to go see some things. Increase in pay will no doubt come as he continues on but it will also come with more responsibilities than you have now. Try to focus on all that fed you this last year and how you are setting a foundation for the years to come. :) Hang in there. Yes! I totally agree! It's so important to live your life and enjoy your time together now. I've always said that I don't want to be down the road someday and look back on life and think "wow, I really wasted all those years looking ahead to the next thing." I know life is crazy busy for you guys, but I'm glad you take time to enjoy the time you DO have together! I'm the worst about constantly thinking about the future. It's definitely good and bad. I want to try to work on living more in the moment! I have felt this way many times in my life. I kind of feel that way now because I am waiting to hear about a major life change, whether it will happen. It feels like it is taking forever, but I know I have to keep loving the NOW in the meantime. I hope you enjoy your remaining time here in Chicago! I hope your major life change goes the way you want it to! Thanks-I'm really going to miss Chicago! I can really relate to this. We have gone through this so many times over the years. When my husband was really sick in the military & they were releasing him it was so hard to wait or know what was happening, so we just kepy wishing for the day he was out. Now, he is going through a really intense academy for law enforcement. It has been really hard emotionally, physically, and financially. It is 8 more months until we will be through it. We are trying to enjoy life as it is because we know that even still, the grass isn't always greener. Sometimes we look back on military life, and despite it's hardships, we find ourselves missing it too! I love this post! I'm feeling a bit stuck now with my husband away at training and having no clue where we'll be living at the end of the summer. It's great that you're making the most of your time in Chicago, a year can definitely fly by! Having all those details up in the air would drive me crazy! I definitely need to try to live more in the moment. I hate that you feel this way, but soon it will pass. I always get in this same rut when my husband's schedule changes back to night shift. Which is currently happening. While I'm grateful we have weekends together, it's hard not seeing him at all during the week because of our conflicting schedules. I'd love to do trivia nights, or get dinner somewhere new. I always feel like I'm stuck at home not getting out trying the world with him. We always get through it though, and we find ways to make up for it. You've done a lot together as a couple, and I have no doubt you will look back and think about how you lived such an amazing life during the medical journey. It is so true! There is value is pushing past the hard times. I know you excited that you've made it to the finish line! Wish you continued success and encourage you in your new chapters to come!